The China Threat continues to remain the plate du jour on the menu of American security commentators. It is also very much at the forefront of political chatter. But explicit statements of China as power monger, hungering to challenge US primacy, tend to be rarer. Hypocritical discretion is the think tank’s watchword. As always, she labours her experience on dealing with business and political leaders as a textbook example of probity, carefully avoiding any mention of her actual corporate record. This enables her to get a sense about the inner workings of Chinese behaviour, even if she seems somewhat short on the historical and cultural front. Throw in a generous dash of ignorance, and we have the Fiorina world view on China, which seems very much that of an aggrieved American CEO, which is what she was, rather abysmally, when she was at Hewlett-Packard. US students, it would follow, do poorly at their exams but have skills in innovation. It doesn’t seem to Fiorina that these might go hand in hand – one can perform superbly in both exams and the realm of innovation. What the GOP presidential contender is seemingly against is the idea that a standardised education system is somehow fundamentally wicked. Such a view enables her to then explain China’s insatiable appetite for acquiring intellectual property (of course, the US, busy powerhouse of innovation, would never do that sort of thing). “They are not terribly imaginative. They’re not entrepreneurial, they don’t innovate, that is why they are stealing our intellectual property.” For all of that, one wonder’s why the Chinese could even be a credible threat. On Wednesday, the views about the Chinese system, and the Beijing agenda, were given a more generous airing. China, she argued on CBS This Morning had “made a bargain with their people” which involve economic gains in exchange for a “repressive totalitarian regime”. In an odd way, Fiorina is describing a social contract, something which should be lauded given the similarly artificial agreement forged between the Founding Fathers and America’s citizenry. The sovereign will of the people has always been a fanciful, if brilliant notion arrived at by the cerebral workings of James Madison. It led to the US becoming a business empire run by set interests and elites ensconced in sinecures of wealth. That bargain has duly frittered away the Republic, which is similarly labouring under various mechanisms of less overt repression. 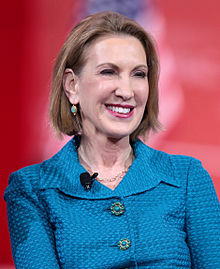 China as threat means that Fiorina is happy to provide advice, notably to President Barack Obama. If she was the one meeting China’s Xi Jinping next month, she would give the premier the proverbial finger of defiance. The US stance against Chinese territorial ambitions would be shored up. The “new Chinese aggression” would be combated with the assistance of regional allies. I would say first that we are going to be more aggressive in helping our allies in that region push back against new Chinese aggression, whether those allies are Australia or Japan or the Philippines. There is no better recipe for war than those who keep belittling the virtues of peace while claiming they are preparing for conflict. Fiorina’s agenda against China is well and truly out of the closet, though it is only fitting to also note her own distinct inability to innovate when in positions of responsibility. Just ask the HP board on that score.